A study of a sprig of oak-leaves with a cluster of acorns. To the left is a drawing of a sprig of dyer's greenweed showing a flower and pods. Melzi's number 128 (verso). 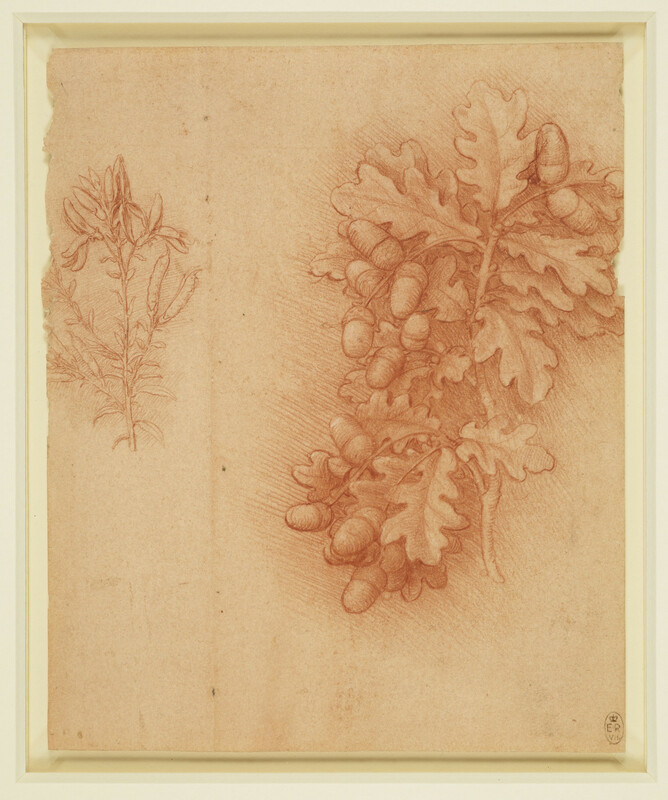 This drawing of a sprig of oak laden with acorns, and a species of broom known as dyer's greenweed, was probably created around the time that Leonardo was working on his painting of Leda and the swan. Many plant studies survive from the period (several executed in red chalk on red paper with an orange-red preparation, as here), since the painting's foreground was to feature a mass of plants and flowers to emphasise Leda's fertility. One might imagine that Charles II would have been especially attracted by this study: he adopted the Royal Oak as his emblem, even considering creating a new order of chivalry, and he never tired of telling of his tale of escape following the battle of Worcester, when he hid from Parliamentarian forces in an oak tree. The red-on-red technique, combining fine detail and tonal subtlety, was used by Leonardo for many of his botanical studies. This drawing displays a great variety of hatching in the backgrounds, the lines of chalk dancing around the plants and within the dense sprig of oak. A vertical fold in the sheet between the two drawings, and what seem to be stitch-holes in the fold, suggest that this is a trimmed folio from a sketchbook of plant studies.